Why do you want to make an export to Google Drive? Store more information than just the test results. 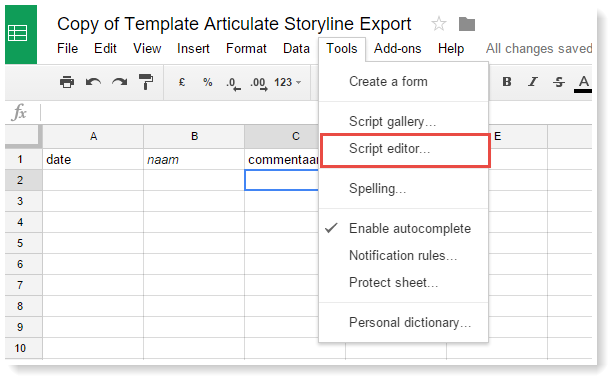 You can export all Storyline variables to Google Drive. And go further with step 4 below! The export consists of several steps. Some steps take place on the side of Google. For these steps you will need a Google account. The remaining steps take place in Articulate Storyline. 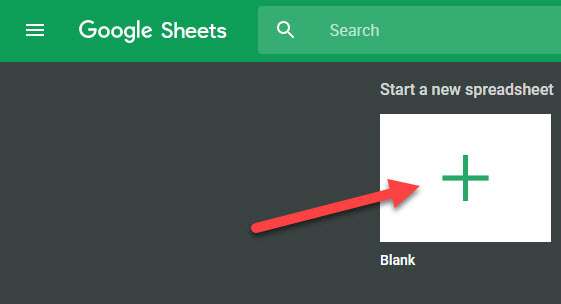 Click on the Plus-sign (+) to create a new spreadsheet. 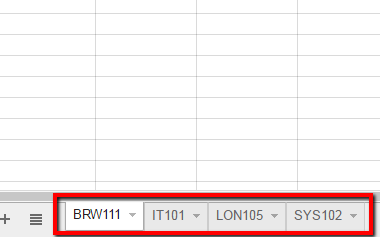 Give the spreadsheet a title and change the name of the sheet to DATA. Add extra columns you would like to use. Probably these columns will have the same name as the variables in Articulate Storyline. As example: the column names name, email and message like in the source project. You can add the column date in the spreadsheet, if you would like to save the date when the form is sent to Google. The column names needs to be identical to the variable names in Articulate Storyline. The column names are case sensitive. Save this KEY in a Notepad file to keep safe, or other application, you will need this ID in step 8. Open the script editor Tools, Script Editor. There is one place in the script where it says var KEY = "KEY". Copy and paste your key between the "". Run the script via Run, setup. The first time you run the script it will ask for permission to run. You will need to grant it. If you run the script for a second time you won't get any popup. This is an indication it has run successfully. Go to Publish, Deploy as web app. Enter a project name (optional) and set security level. Choose for Me and access Anyone, even anonymously. 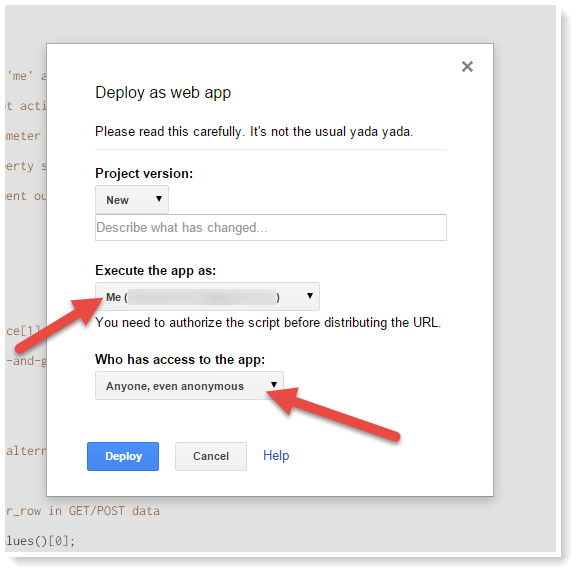 Click on the button Deploy to create the web app. Copy the 'Current web app URL' and paste it in a Notepad file to keep safe. This code will add the jQuery library to this project, so you won't have to change the HTML files after publishing the project. The jQuery library is needed for exporting the information to Google Drive. 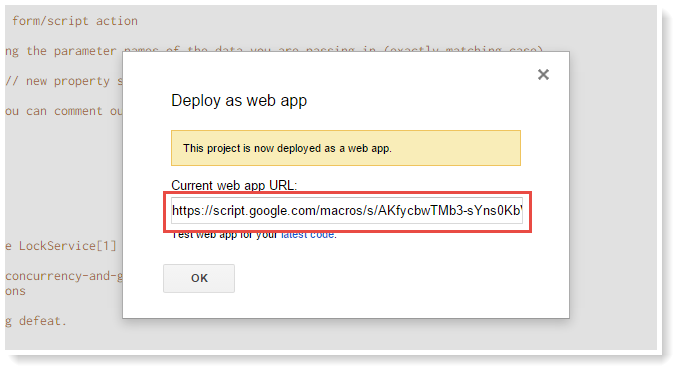 Replace the value Current web app URL for the webapp url you've saved in step 11. Below the webapp URL, you can place the column names of the spreadsheet and the Storyline variables. Please be aware of the comma if you add multiple variables. Publish your articulate project to WEB or SCORM format. You need to host it on a WEB server or somewhere like SCORM cloud (or a LMS). I got it to work. Thanks for your help! One thing to add to the list of dos and don'ts: I think only text variables work. I had it set up so that when a user clicks a box, the variable that feeds to to the spreadsheet is set to equal another variable that equals Yes or No. It wouldn't work, but when I set it to equal Yes when the user clicks Button 1 or No when the user clicks Button 2 it worked. I've read the post and followed the steps. I managed to make it work for open questions like described. But i would also like to use it for mc-questions (I use the freeform pick one/many). Would that be possible? I was only able to get text variables to work. I didn't use any other step as described above. In the attachment you'll find the Storyline project. I think you could use different sheets, because every sheet has his own WEB APP URL. Thanks for this ultra helpful post! 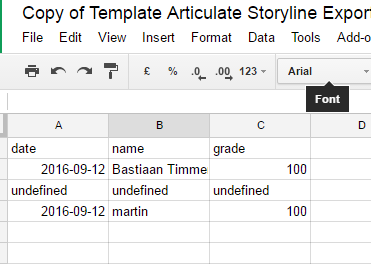 It took me a long time, but I've finally got articulate storyline 2 and google sheets talking to one another. I used the method above. The date and the name fields are coming through just fine, but I have a third field set up to record the course grade, and it keeps giving me a grade of zero, regardless of what the actual grade was. I've attached my test file that I'm using to communicate with google sheets. Can someone point me in the right direction why the grade keeps showing up as zero? Do you have the link of the spreadsheet, so I can test the result? So, what needed to be changed on it? Great to hear it worked. You will have to move the selected trigger one position up. So you will first set the variable and then go to the next page. Normally we place this trigger on the "Success" and "Fail" layer. And then with the setting "When Time-line starts". Not a problem Leslie! It's a nice way to save some information without LMS. Thanks again! You really helped get my project back on course - I'll remember about the order of things in the triggers. Sometimes I forget that the order in the list makes a big difference. I'll be sure to remember that from now on. I've got one more question - I'm not sure if I'm searching for the right thing in the forums, so I haven't really seen this specific challenge come up yet. I've got a single spreadsheet in google drive with multiple sub-sheets within it (1 for each course). Is there a way to have the variables export to a particular sub-sheet? The URL key used in the steps for the variable export does not change, no matter which sub-sheet you are in. All that changes is an ID number that is appended to the end of it. There is only a single script editor page for the entire sheet, not separate ones for each sub-sheet. Any and all help would be welcome! On line 2 you will see the Sheet name. 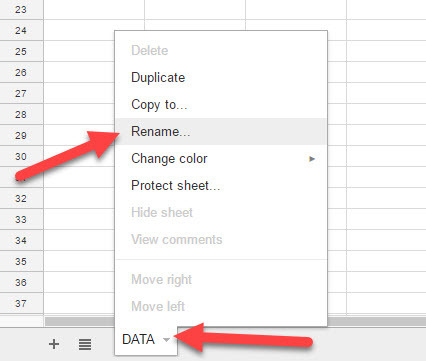 Change the value "DATA" to the value of your sheet name. I hope this wil help you to finalize your project! Success! That part of the process is clear to me - as I mentioned, I did get it to work. 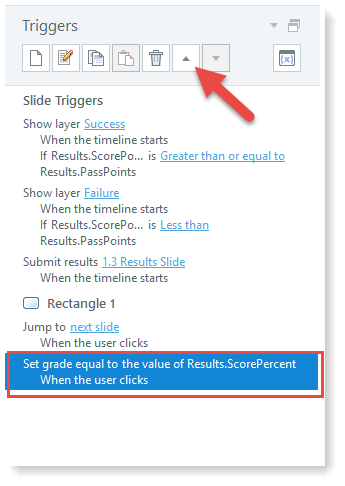 But from what I see, the way this is set up, is that you can send the results from one course to one sheet, or even to multiple sheets, but I don't see the way to send the results from multiple courses to multiple tabs within a single sheet. But I want them to go into three different sub-sheets (or tabs), one for Course A, one for Course B, and one for Course C within this one results spreadsheet, rather than create three separate spreadsheets for Courses A, B and C.
Is this possible to do? Or should I just be creating a separate spreadsheet for each course? Sorry to keep beating away at this point - its not the end of the world if it can't be done, but it would be convenient. I don't know a specific solution for that approach. But you could also add an extra variable (column) to the spreadsheet, so you could use one spreadsheet for multiple courses. In this extra column you could placed the course-id or course name and you could use this specific column to sort your data. Maybe that's a solution for you. As ever, thanks so much for the help Bastiaan! I had a feeling it couldn't be done, but wanted to make sure I'd explored the possibility. It's going to have to be separate spreadsheets, I think, for everyone's sanity. a) Will it work for concurrent users ? I have several users taking the course at same time ?Will it create a seperate row in Google Spreadsheet for each user ? or overwrite in the same row ? It will create a separate row for each submit action. I don't know what will happen if two users submit the form at exact the same time. But I don't think this will be a problem. This script won't update an existing record. So it will create a new record for each question and you will have to filter the records in Google Drive. For anyone following along, I wanted to let you know that Abhishek asked a similar question here as well. It will help a lot not to create a row for each interaction within a same session. First I want to find out in which way we can import the result of the spreadsheet back into Storyline. So you can compare your answer with other learners. That would be a great interaction. I will update this topic when I find a solid method to accomplish this. "Hi Elizabeth, If you follow the steps carefully then the spreadshe..."
"Thanks so huge for this helpful and superb tutorial... I managed to..."
"UPDATE 2017-06-06: There is also an article available for importin..."